Robert Hoy was born in New York and raised in the Adirondacks. He attended New York Military Academy, a prep school for West Point, the life for which he was being groomed. Life, however, took a sharp turn when, instead, he chose to enlist in the Marine Corps in ‘44. Honorably discharged in ‘46, Bobby migrated to Nevada where he cowboyed with those years having a profound effect on his life and film career. His film debut was in a western, “Ambush” in ‘49 where he met new life-time friends like Robert Taylor, John McIntire, and John Hodiak. While performing stuntwork alongside Walt LaRue, Jim Van Horn, and Fred McDougal, Bob formed life-long bonds and began his career as a stuntman. This incredible behind-the-scenes-world of doubling actors, portraying an “Indian” in a scene and, sometimes within hours, changing horses, wardrobe, and makeup to portray a “Trooper” in the next scene, fit Bobby’s skills like a glove. “Ambush” was the first of over 40 westerns in Bob’s multi-faceted film career and remains one of his favorite film experiences. His debut as an actor came in 1953 in another western, “Border River”, starring Joel McCrea. 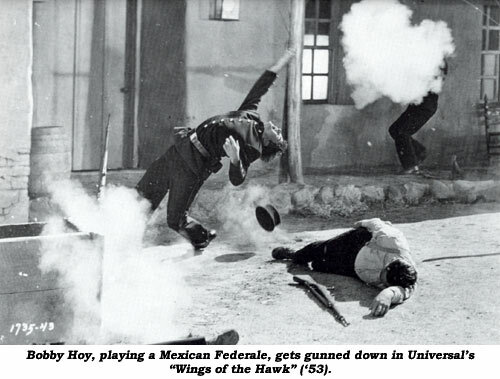 Robert was stunt-doubling two actors, Pedro Armendariz and Alfonso Bedoya. Director George Sherman noticed Robert’s work and offered the role of a Cavalry Sgt. to him. 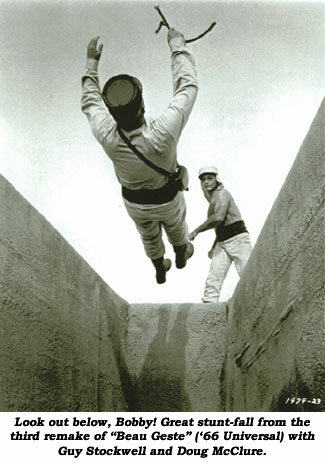 These first scenes as an actor in “Border River” began a new and rewarding career as actor/stuntman for Bobby who joined the ranks of a very few stuntmen such as Jock Mahoney and Richard Farnsworth to successfully incorporate acting and stuntwork throughout major motion picture careers. 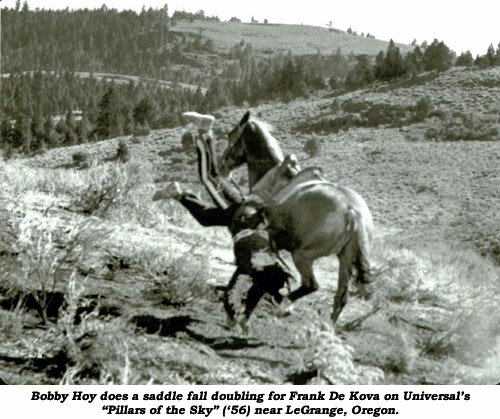 Robert’s career continued with many stunts and roles in western films such as “Lawless Breed”, “Destry”, “Four Guns To the Border”, “Taza, Son of Cochise”, “Raw Edge”, “Gun For A Coward”, “Bite the Bullet”, “Outlaw Josey Wales”, “Nevada Smith”, “Five Card Stud”, “Duchess and the Dirtwater Fox” and “Legend of the Lone Ranger”. Bobby’s television appearances include guest star roles and co-star roles in just about every western TV series since the ‘50s: “Gunsmoke”, “Laredo”, “Wanted Dead or Alive”, “Virginian”, “Have Gun Will Travel”, “Guns of Will Sonnet”, “Zane Grey Theatre”, “Outlaws”, “Barbary Coast”, “Branded”, “Lone Ranger”, “Rifleman”, “Death Valley Days”, “Wyatt Earp”, “Cade’s County”, “Daniel Boone”, “Laramie”, “Rawhide”, “Zorro”, “Young Riders”, “Walker, Texas Ranger”, “Little House On the Prairie”, “Bonanza”, “Wild, Wild, West”, “Father Murphy” and various movie-of-the-week specials including “Gambler II”, “Sam Houston, Legend of Texas”, “Over the Hill Gang” and “Bonanza, the Next Generation”. Bob has been in two western series as a cast regular. In Disney’s “Texas John Slaughter” he played the role of a Texas Ranger alongside series star Tom Tryon. On the hit TV series “High Chaparral” Bob co-starred as Joe Butler, brother of Don Collier as Sam Butler. Producer David Dortort gathered a distinguished cast that included Leif Erickson, Cameron Mitchell, Linda Cristal, Henry Darrow and Mark Slade. After seeing Bob on an episode of “Bonanza”, Dortort asked Bob to join the series as a regular for the entire four years of the show. “High Chaparral” remains today a classic, and one of the most popular TV westerns ever shown. It stands now in the record-books as one of the most re-run series ever produced. In ‘91, while guest starring on an episode of “Zorro” in Spain, Robert was offered the 2nd unit director and stunt coordinator position on the TV series. He joined the Directors Guild and, in Spain, shot a television pilot of “The Three Musketeers”. Bobby Hoy, actor/stuntman/director, was a member of the Motion Pictures Academy of Arts and Sciences, Directors Guild of America, a founding member of the Stuntman’s Association and was honored for his “Accomplishments and Dedication” by the Stuntman’s Association and awarded a “Lifetime Membership.” My friend and mentor and one of Hollywood’s finest stuntmen left us at 82 on February 8, 2010.